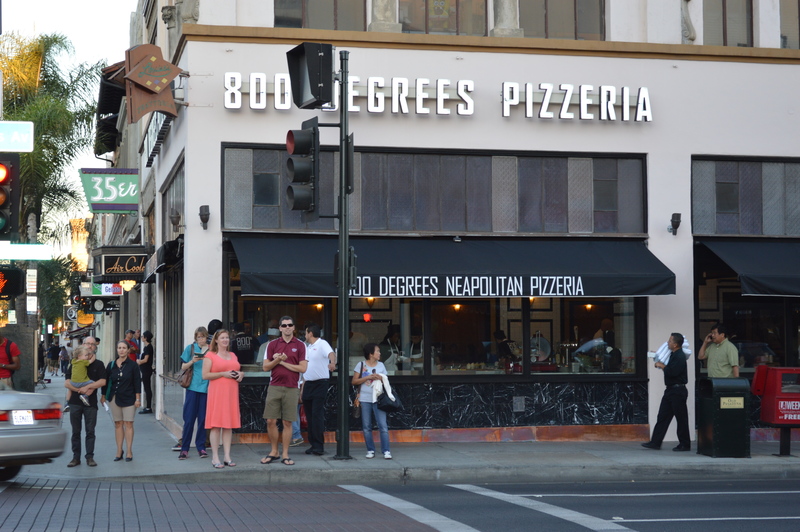 I was so excited to see a line of people eager to try 800 Degrees pizza last week. Co-owner Allen Ravert greeted me inside and showed off the interior decor. All of his Umami Group restaurants have chandeliers, an animal head (usually found in consignment stores in Palm Springs), unique wall colors and mirrors. 800 Degrees in Pasadena doesn’t disappoint. Located in a historic building on the corner of Colorado Blvd. and Fair Oaks, it’s designed by John C. Austin, the architect who designed Griffith Park Observatory and the Los Angeles City Hall. Ravert took me into the ordering area and had me admire a beautiful mural on the wall. “As we removed the drywall, we discovered this beautiful mural from famed Pasadena artist Kenton Nelson,” Ravert said. “It’s now restored to its original beauty and located in the ordering room.” Ravert is talking to Nelson about putting up more artwork in the dining area. 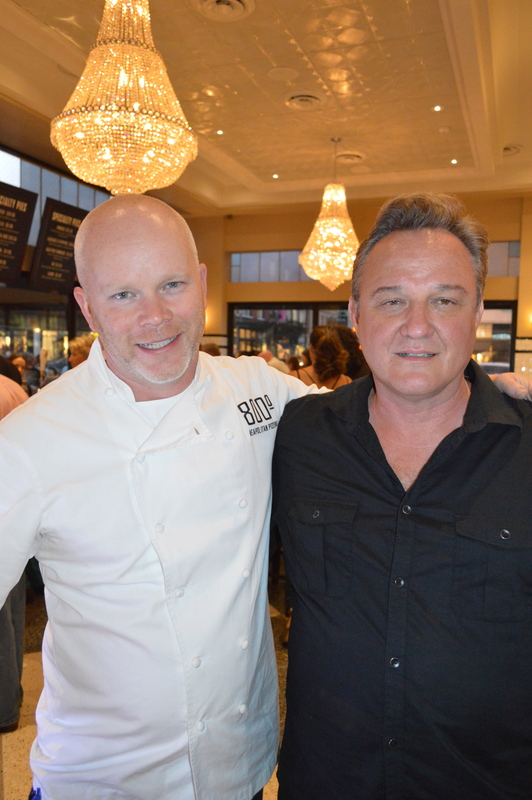 The Umami Group, Adam Fleischman and Allen Ravert, met Executive Chef Anthony Carron in Las Vegas years ago and discussed creating a new concept in pizza that would change the pizza world. Fleischman had so much success with his Umami Burger and believed pizza offers that same satisfying Umami experience. Carron created a menu of pizzas that could be assembled and baked in less than two minutes. 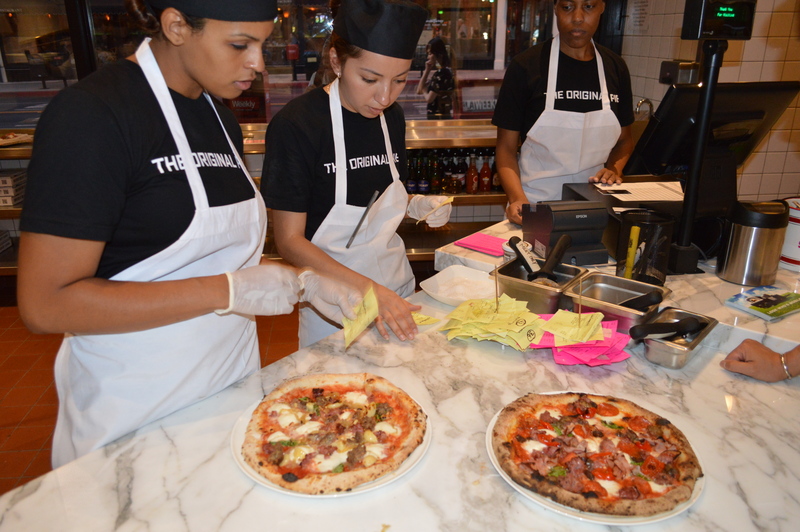 They opened their first 800 Degrees in 2011 in Westwood, near UCLA and became an instant success. Soon after, fast-concept pizza restaurants opened soon all over Southern California. 800 Degrees enjoyed the Westwood community and opened in Santa Monica. They also believed it’s an ideal concept at LAX for travelers to order quickly and take a meal to enjoy during their flight, so they opened at LAX. Then Vegas called, and they opened in Las Vegas at the Monte Carlo Resort. What makes this pizza so tasty? Carron perfected the crust made in-house from only Italian flour, wild yeast, sea salt and filtered water. He purchases the freshest ingredients to create classic Neapolitan pizza. Naturally grown California tomatoes, and cheese from Di Stefano by the Bruno Family, known for their amazing Burrata cheese. They also make classic salads that include a Gorgonzola, Caesar and a “Create Your Own. Their Burrata is served with beets with balsamic, cherry tomatoes with pesto, artichokes, olives and prosciutto with melon.terrific wood-oven meatballs baked with tomato, oregano and Parmigiano. There is truffle cheese bread and wood-roasted broccolini with garlic, Calabrian chiles and olive oil. You tell your personal chef the ingredients you want on your pizza and he/she will assemble it, pop it in the 800 degree oven and hand it to you within one minute. It’s easy to walk out satisfied for less than $10 per person. They have other 800 Degrees planned to open soon at Downtown LA – 800 Wilshire Blvd, Los Angeles, CA 90017. Another in Las Vegas – SLS Hotel and Casino – 2780 Las Vegas Boulevard South, Las Vegas, NV 89109 and The Runway at Playa Vista – 12751 Millennium, Suite #B135, Playa Vista, CA.